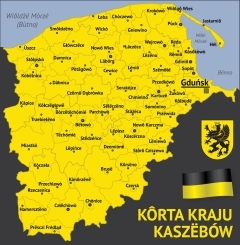 PURPOSE: The purpose of this unique sporting event is to promote and strengthen the Kashubian Identity In Kaszëbë the homeland and native land of all the Kashub people around the world. It is also home to the first Kashub pioneers who immigrated to Canada in the year 1858. The fifth and sixth generation descendants of these first pioneers have formed the Kashubian Griffins Hockey Team to promote the Kashub people, the Kashubian culture and the homeland and nation of their Kashubian ancestors. The team is also known as the Kashubian National Hockey Team in Kaszëbë. It just happens that they are the only Kashub hockey team in the whole world. These Kashubs will be proudly represent the Kashub Nation and they hope to encourage the young Kashubs in Kaszëbë to take up the game of hockey which is very popular with Kashubs in Canada’s Kaszëbë. The teams hope, is to see a Kashubian Hockey Team created in the homeland where they will become the team who will represent the Kashub people and their fatherland in the future. Using sports to promote heritage is a great vehicle in keeping awareness of your cultural roots and the weekend of April 5th and 6th will showcase how proud the Kashub people are of their culture and heritage. This event may also inspire other sporting event to use their sport to promote culture and heritage. Wiedno Kaszëbë i na wiedno Kaszëbi. GOALS: Some of the goals for the Kashubian Griffins on this cultural tour are to show pride for the homeland of Kaszëbë. To touch and kiss the soil of their ancestors native land. They would like to meet as many Kashubs as possible, especially one with the same family names and also to connect with some of the villages that their ancestors hailed from and where they were born and went to church. One of their thrills on this trip, is that they will be playing hockey in Gduńsk /Gdansk, the capital city of Kaszëbë. This is not just a honor, but a privilege and they hope to be true Kashubian Ambassadors while they are in Kaszëbë. TRIBUTE: The Kashubs in Canada, lost a great Kashub friend in Daniel Czapiewski and they will be paying tribute to this Kashubian Giant at these games. Daniel was instrumental in helping in bridging the Kashub people in Canada’s Kaszëbë and also in Kaszëbë. He was a true promoter of all things Kashubian. He was a proud Kashub and very proud of his homeland of Kaszëbë. With the help of Michał Śmigielski from the small Kashubian village of Chwaszczyno, we will make sure that this great man will never be forgotten for his work in helping promote and preserve the Kashubian culture and identity. Daniels last words to the Kashubs in Canada on his last visit to Wilno was “ Wiedno Kaszëbë” – It was always Kashubia for Daniel. SPECIAL THANKS: Special thanks goes to Michał Śmigielski who is organizing the hockey arena facility and providing the hockey teams from the Gdansk Hockey League to play against the Griffins. Sopot Mad Dogs Hockey Team and the Gdansk Dragons Hockey Club will represent the Hockey League. DROPPING of the GAME PUCK: Pomorania Student Organization President Magdalena Bigus – Kashubian Pomeranian Association President Łukasz Grzędzicki, Beata Jankowska and Kaszëbskô Jednota President Mateùsz Titës Meyer.